32. 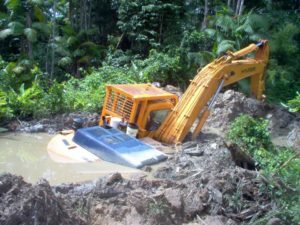 Using Sand to Build Roads - KJ Kuchling Consulting Ltd.
Several years ago I did some geotechnical consulting for BHP’s bauxite mining projects along the north coast of Suriname. The mines were located in swampy terrain, overlain by very soft clays. 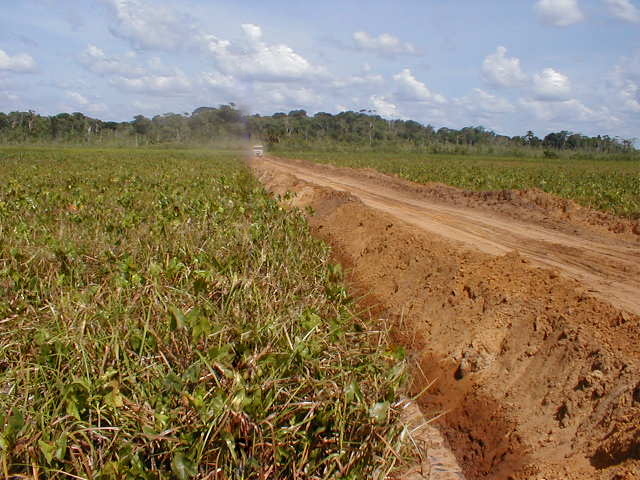 The picture below shows the typical landscape when crossing a swamp. Haul roads were needed to access the small satellite bauxite pits, which were spread several kilometres apart. Where haul road construction was concerned, there were no nearby gravel pits or road aggregate supplies but there were significant amounts of fine sand on the high ground “islands” in the swamp. Road building mainly relied on end dumping truck loads of sand, allowing it to settle and sink into the swamp, and then continue adding more sand until the settling process stopped. This resulted in high cost roads and very slow progress in construction. Periodic rainfalls, particularly in wet season, would cause havoc with the trafficability on the fine sands. How soft were the swamps clays? See the photo to the right. Where there was significant swamp vegetation (like in the photo above), it would be buried by the fill, helping to form a mat. This supported the road fill and minimized the sand losses into the sub-grade. However in some parts of the swamp the vegetation was minimal and therefore sand settlement losses could be high. Geotextiles were applied in some areas, using a geogrid. These were successful although large amounts of sand were still required as the entire road would compress the underlying clay. Once a road was built, the next issue was the trafficability on the fine sand surface, especially after rains. The sand would rut and require constant grading and repair. Final road capping would consist of laterite when available. Laterite is a high iron off-grade bauxite that could be compacted to form a hard surface but would still degrade and get slippery when wet. If coarse aggregate had been available locally, road performance would have been much better but one had to work with what was available. A few years later I saw a video about a geo-cell solution for building roads with sand only. The website is The PRS-Neoweb™ Cellular Confinement System (www.prs-med.com). I think there are other similar geotextiles available but this is one that is well described on their website. Sand is placed into the geoweb, which eventually forms a stiffer layer. I assume that one could place the sand using mobile equipment or by hydraulically pumping coarse sand as a slurry. In hindsight, I would have liked the opportunity to test the geo-cell system in the swamps of Suriname. Potentially it would have been a good solution to prevent both sand losses and create a more trafficable surface. I’m not certain if the best location for the geo-cell would have been along the sub-base of the road to support the sand load or near the surface to help create a more trafficable surface. Maybe it would have been beneficial in both locations. Building a road over a swamp in South America is somewhat similar to building a road out onto a tailings pond. Possibly the geo-cell would have application there too. Another large earthwork project we undertook in Suriname was building a dragline walkway across a swamp. The walkway was 4 km long, 30 m wide and about 2 m thick. That requires a lot of fill. We built this road using hydraulic sand. Boskalis, a Dutch dredging company, collect sand from the bottom of the Suriname River, barged it to a site about 5 km from the walkway, and then pumped the sand to the construction site. The hydraulic sand was discharged between two bunds where it quickly settled out. It was somewhat similar to a tailings disposal operation. Placing the sand this way was low cost and didn’t require trucks driving out onto the swamp. It also advanced the road with a very shallow front face, avoiding slumping failures or mudwaves ahead of the advance. Softer parts of the walkway route also incorporated geotextiles. Unique operating procedures may be required when building roads over swamps due to the unstable conditions one may encounter. Geotextiles have many applications in the mining industry. There can be significant up-front costs to purchase and install them but don’t let that scare you away. The savings may been seen down the line. They are definitely worth a look. The benefits of well designed, constructed and maintained roads are underestimated by many managers nowadays. It’s hard to spend money to crush proper road dressing when metal prices are collapsing but it’s money well spent to increase tire life and reduce rolling resistance.